And A Player To Be Named Later: What's Up with Jeter? The Yankees are winning. Their pitching is pretty good. The bats are nice and they are leading in the AL East. All of which is covering the fact, that at the pate, Derek Jeter is having his worst year in....well, quite a while. The sneaky truth that no one is talking much about is....Jeter’s batting average is down over 50 points from last year. And that includes the recent hot streak. The stats go on. His R/C is the lowest since 1995, which really means, his lowest ever. His BABIP is his second lowest ever. His OPS+ is his second lowest ever. And his OBP is the lowest of his full-time career. But two stats interest me the most. Jeter’s O-swing percent—percentage of pitches a batter swings outside the strike zone—is the highest of his career...by a long shot at 28.9%. And the second stat is that Jeter’s pitch per AB is the second lowest of his career. Which, to put it succinctly, means that Jeter is swinging at more pitches, and a lot of them are pitcher’s pitches, not hitter’s pitches. Which would explain his low bating average and which explain why his LD% is the lowest of his career, while his GB% is the highest of his career. And why Jeter’s walk percentage is down from 10.1% last season to 7.9% this season. Well, why is Jeter jumping at pitches? The most logical guess is that, at age 36, Jeter’s bat speed is finally slowing down. And Jeter’s wFB (runs above average per fastball) numbers are indicative of just that. Last year, Jeter’s wFB was 27.8. This year, it’s 2.2. In an article that was astonishingly prescient, last February, theYankeeU warned of a Jeter decline. 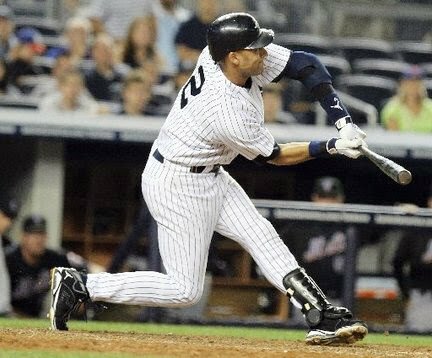 In an article quoting WFAN's Sweeney Murti which talked about the decline of Roberto Alomar at age 34, theYankeeU compares that article to Derek Jeter. But when some players lose it, there’s nothing ‘averaged out’ about it. Their bat slows down, and they can no longer get around on the fastball. So they adjust and start sitting on breaking pitches. Pitchers notice this, adjust accordingly, and give the player a steady diet of nothing that he can handle. They challenge him with hard strikes in the zone (that he has to swing at) and the breaking stuff gets put in places where the batter can’t do much with it. Next thing you know, he’s having an awful season and most fans can’t figure out why. Sound familiar? Diving at breaking stuff out of the strike zone? Not being able to get around on the fastball? Let’s face it; Jeter’s bat speed is declining. Which is not to say Jeter should be junked. But it might be time to switch Jeter from the leadoff spot. Perhaps getting him off leadoff might ease some pressure he might feel. And for the time being Brett Gardner could take leadoff duties. If nothing else, Gardner makes pitchers work harder than Jeter does at this point; 4.63 pitches per AB to Jeter’s 3.55. Jeter’s OBP is 343 and wRC+ is 105 to Gardner’s .386 and 122+. And of course, Gardner’s SB total of 32 dwarf’s Jeter’s 12. In the long term, if Gardner can’t handle the 1-spot, Carl Crawford could be an option. Or someone from the minors may step up. But as for the 2010 Yankees, right now, it might be time to pull Jeter from the leadoff spot. He may too old for it anymore. His bat speed looks slow, like he can't uncoil and rip the ball. He was having a good year until he hit a wall. if he is in decline it was bound to happen at some point. If you include his 637 PA's from the postseason he has played 16 full seasons' worth of games (plus his sept call up) in the majors. Other than 2003 he has played 150-160 games per year. Wear and tear catch up to a 36 yr old everyday player. Look at Chipper (sorry to see him go down at this point in his career), he is two years removed from hitting .364 and declined last year and again this year. Both are still better than many but not what is expected from HOFers.